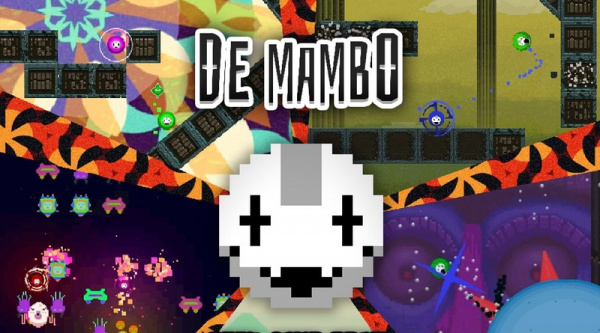 De Mambo is probably as “indie” as an indie title can get. The game was created by The Dangerous Kitchen, a team of just three animation graduates who decided to learn how to code and use the luxury of a Premier Inn as their office space. After what we’re sure was a tough but enjoyable journey, De Mambo was born – a fighting (kind of) game with action and platformer elements that was heavily inspired by none other than Super Smash Bros. 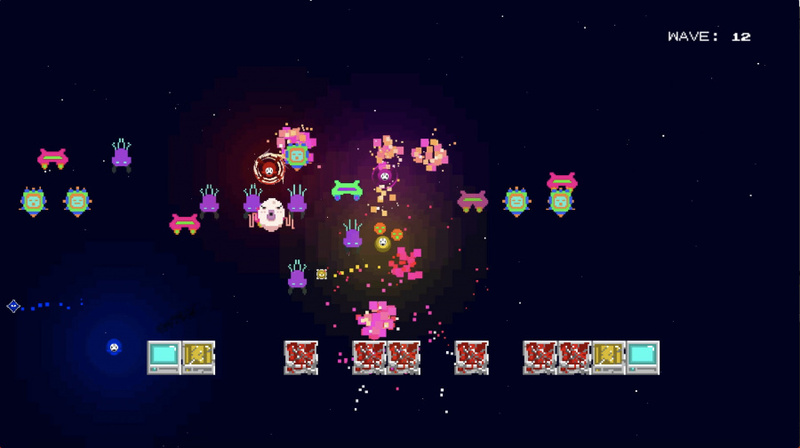 The game’s main mode is a chaotic, multiplayer battle set in any one of a whole variety of stages. Each player takes control of a small, ball-shaped character (each choosing their own colour to differentiate themselves) and is thrown into a free-for-all match to the death. The controls are intentionally basic; you have a single attack assigned to the A button and the left control stick or D-pad is used to move and jump. That’s it. Your attack can be charged up by holding the A button down for a short period of time, allowing three different types of attack to be used from a single button. Like Super Smash Bros., from there your goal is to "smash" your opponents off the stage, using a powerful enough attack or clever use of the scenery. The beauty of these matches lies in the arenas themselves. 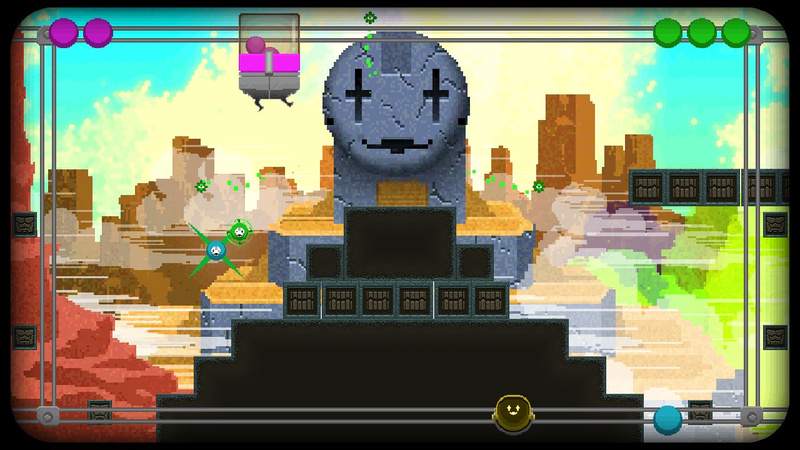 Stages are mostly made up of breakable blocks, meaning that at first it is often impossible to smash a character off the screen – you need to punch through the scenery first. 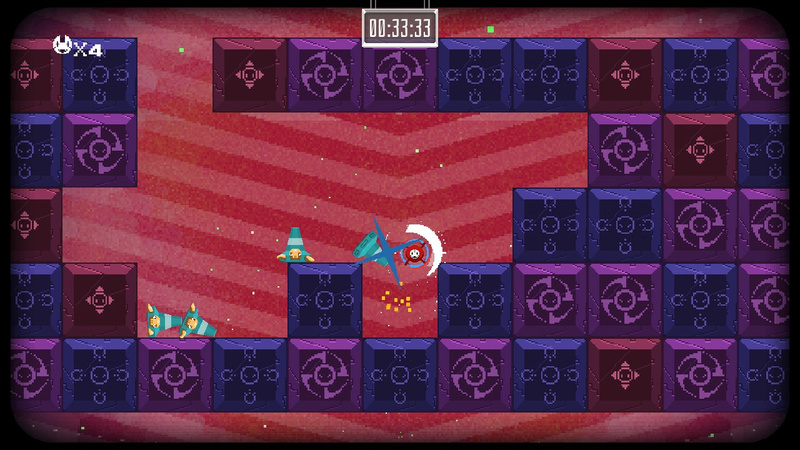 When you attack a player with enough force they will be sent into these blocks, cracking and damaging them as they collide. Eventually they will crumble away completely, leaving gaps for you to try and send your opponent whistling through – and of course, try to avoid yourself. Each player starts with just three lives, so you don’t want to make any costly mistakes. The more players you manage to assemble (up to four are supported) the more enjoyable/frenzied these matches become, as trying to attack and avoid each other becomes much harder and you’ll find that not many seconds pass by without someone whizzing around, bouncing from wall to wall after a powerful attack. Eventually, and as time progresses, the breakable blocks and sometimes the solid floors will slowly start to disappear by themselves meaning that games will never be held to a stalemate for long. At first, only a handful of stages are available to try out, but as you play more matches you’ll begin to unlock new places to brutally beat up your friends. The stages are what really help this game sing; you start in simple arenas with only a basic edge of breakable blocks, but you’ll soon be moving on to arenas with lava, water, pipes that make you warp across the screen, and more. These add a wonderful – and eventually necessary – freshness to the game and will keep you on your toes as you play through several matches. On the stage selection screen each player can pick which level they’d like to play on and – once everyone has decided – a roulette begins to see which will be chosen. This should mean that everyone will get to play on stages they like eventually. There are also two other modes on offer should you want a break from seeing your spherical self being thrown around uncontrollably. The first of these is Survival mode where, either alone or with friends, you are tasked with surviving as many waves of enemies as you can before they manage to break the floor you are standing on (or before you just jump off by accident as we did… many times). The further you progress the more enemies you’ll see descending upon you and the more variety of enemy types will begin to appear, too. This is a co-op experience should you be playing with friends, although with high-scores – and therefore bragging rights – up for grabs you may want to try and kill more enemies than your allies. If that requires some occasional friendly-fire attacks, then so be it – just don’t tell them you got the idea from us! Finally, there's a solo mode available which is a rather different experience. Here you are tasked with completing multiple challenges as you travel through the ‘Tower of Destiny’. 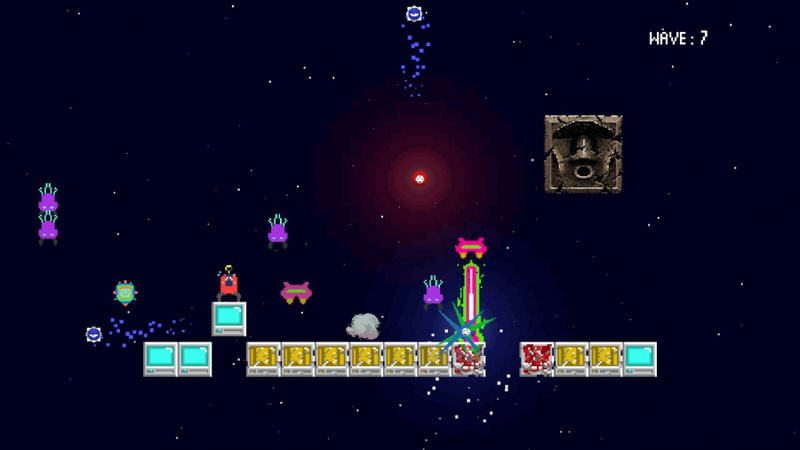 Instead of the chaotic fighting from before, this time around the challenges vary much more and the game feels like a different genre entirely; for example, ‘Escape’ challenges see you having to find the exit of a room before the time runs out using platforming and/or combat skills, ‘Destroy’ challenges make you defeat a certain number of enemies, ‘Collect’ challenges task you with finding several of the same object in the time allowed and there are even some ‘Boss’ stages which can be excruciatingly tricky. There are several difficulty options available to choose from as you play through this mode with a significant difference between them – the harder stages are really, really tough. Whilst you may not reach the top of the tower on your first run (by running out of lives), you should slowly start to learn the best way to tackle each challenge as you retry. The game is very nicely put together; lots of control options are available should you want to change your button layout, the music and art-style really work and the menus and dialogue throughout are oozing with comedy. The only decision that seems strange is the fact that the main mode cannot be played solo – you need a minimum of two players. Thanks to the Nintendo Switch coming with two Joy-Con this is helped a little as there is no need to splash out on a new controller just to play, but for anyone who prefers to game alone you may be disappointed. As the game is clearly designed primarily for multiplayer madness this isn’t a huge issue, but considering its hugely-loved inspiration lets you play Versus mode against AI opponents, it is a shame that the same doesn’t apply here. De Mambo does exactly what it is meant to do by taking over your living room and providing you and your family or friends with utter chaos and fun. The core gameplay works a treat and its simplistic control method and ideology suit the game perfectly, resulting in a competitive title that is easy to learn, yet hard to master. For solo players, being unable to play what is essentially the heart of De Mambo in its main mode makes it impossible to justify a purchase. For people who want to grab some friends and have something to pass the time however, this is a suitable option, even if it maybe won’t keep your attention for hundreds of rounds. The gameplay does eventually get repetitive, although great strides have been taken to ensure this doesn’t happen too quickly and there is definitely much fun to be had here. Though the single player sounds like it might be. The devs did an AMA on reddit. Game sounds pretty cool. I'm nervous the recent amount of throwaway mobile phone/tablet games being released via the Switch is the new focus. @Pazuzu666 That was never a mobile game. This was developed for pc, ps4 and switch, with timed exclusivity to switch. Were you thinking about Implosion? It's not throwaway though. Sure, you can feel it came from mobile, but it has quite decent gameplay. @Pazuzu666 @Hrimfaksi I've also never been a fan of mobile games myself, but I don't see their mere existence on Switch as a problem (Although, as mentioned, this isn't a mobile game). I figure if people want to play them, have at it. There's still plenty of non-mobile ports available to play. @Hrimfaksi honestly people are so up there own butts these days about indies, if a system gets an indie it shows weakness. All major systems are flooded with indies and indies keep a system alive during droughts. I'm surprised about the good score for this game, I don't see it as that good. Looks like a nice game, might check it out when I have some money left to spare. @SLIGEACH_EIRE That.....was the very first thing I thought of......well done, sir. They need to update their description on the eShop to "also uses the D-pad/stick". Don't need that kind of confusion in your purchase. Absolutely getting this tomorrow! Wonder if main mode will get a single player vs cp update? Seems super odd it doesn't. If it had online play that'd be cool. It sounds fun, but I'd rather just play an actual Smash Bros. game (even the original one) rather than settle for this poor man's version of the idea. I'm partially brain dead, does this game have online multiplayer? This site is very generous with it's scores...just looking at a few screenshots and I can tell this is garbage. @Pazuzu666 I think you're confusing innovative small team indie studios using retro style graphics with freemium mobile trash. There's been a huge surge in local multiplayer gaming for couch PC setups and this is part of that movement. It makes sense to see those porting to Switch. I'm a big a fan of Nintendo as the next, but I can't believe the numbers supporting throwaway titles such as this (for example). A good VC would be a far, far better way of filling the gaps in release scheduling. Arcade ports of classics every week please...not difficult. @Pazuzu666 Games like this are popular on Steam and support the Switch's concept of reviving local multiplayer. Give me games like Nidhogg, Speed Runners, BroForce, Towerfall, Overcooked, Duck Game, Lovers in a Dangerous Space Time, Crypt of the Necrodancer, Gang Beasts, etc and I'll rebuy them because they work so well with the handheld multiplayer idea. And considering it costs Nintendo minimal resources to put these games on the eShop, and their existence has no impact on whether or not they've delivered on the virtual console yet, AND it's easy profit for Nintendo, it's not all that surprising.